When Never Shout Never first cranked open the doors to wailing teen/tween girls back in the sooty prehistoric wilds of 2005, Christofer Drew Ingle was calling it NeverShoutNever. He achieved substantial MySpace success thanks to an EP that featured a ukulele and a sugary, "aw shucks" vibe that drove girls bananas. In 2008, Ingle went through a colossal personal transformation and converted the name of NeverShoutNever to NeverShoutNever! Things would never be the same again…until a few years later when the spacebar was finally discovered and Ingle’s alias legitimately became Never Shout Never. His debut major label LP, What Is Love?, ran an immense 20 minutes and didn’t feature the Haddaway cover I was hoping for. So now here’s Time Travel, another massive change in direction that, all kidding aside, doesn’t just amount to a name change and some endangered punctuation. No, Time Travel is the first Never Shout Never record to feature a full band. That means that Ingle is joined by Caleb Denison (drums, guitar, vocals), Taylor MacFee (bass, vocals) and Hayden Kaiser (guitar, vocals). The direction is away from the soft-focus trying acoustic and toward the extravagant trying rock opera stuff. 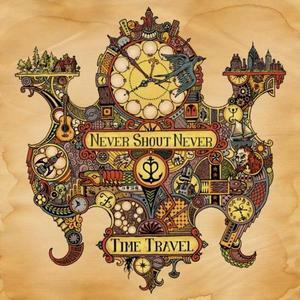 While the shift will perhaps build some new admirers for Never Shout Never, Time Travel is far, far, far from a good album. In keeping with the trend, Never Shout Never provides a whopping eight songs. Happily (or unhappily, if you’re me), most of the songs exceed the customary two-or-so-minute mark of Ingle’s prior exploits. Musically, there’s no denying the fact that Ingle has big visions. He is a capable instrumentalist in his own right, but he doesn’t seem to have any inkling as to how to space things out or make the most out of his bandmates. Almost every square inch of Time Travel is filled with frothy Owl City-esque vocals that carry on with all the panting, twee crap devotees eat up by the pail. Lyrically, the album is hard to stomach – especially if you find yourself in the disagreeable position of being over the age of 14. Consider the slushy, pity-me-please rubbish of “Robot” as Exhibit A. “I’m just a robot, I have no fears, I lack emotion, and I shed no tears,” Ingle warbles with the penetrating, woe-is-me resolve of a suburban teen denied an iPad for Christmas. Of course, the aforementioned “robot” has no complications chirpily hazarding right into the sort of “we’ll always be together” junk that fills up “Silver Ecstasy” and “Simplistic Trance-Like Getaway” with so much pseudo-romantic nonsense. Ingle’s hodgepodge of lyricism, most of which sounds culled from the social media accounts of spoiled underage girls with no understanding of real relationships or the pains and ecstasies of love, is the nail in the coffin for this ridiculous record. Time Travel is infantile, stupid and corny beyond reason. It will, without question, hit its target market right between the doe eyes.